A logical game, which is a continuation of the well received Euclidean Lands, published in 2017. Production offers dozens of levels, full of puzzles and dangerous opponents, as well as beautiful graphics (with support for augmented reality technology). 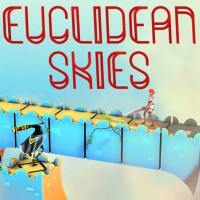 Euclidean Skies is a logical game, which is named after the well-known mathematical concept of "Euclidean space". The production is a kind of continuation of Eucildean Lands, which in 2017 found its way to devices with iOS system. The title also has support for augmented reality technology. Like the first production in the series, the project was developed by the independent creator Miro Straka. In Euclidean Skies we play the role of a pink-haired traveler, armed with a sword, who travels through a surreal land full of twisted buildings and dangerous monsters. In Euclidean Skies we observe the action from above, from the isometric perspective. The game consists mainly in appropriate manipulation of the environment. We can rotate both the boards built of cubic blocks resembling flying castles and their individual elements at any angle, thanks to which we give the possibility to pass our heroine (it's a bit like using a Rubik's cube) and avoid traps and enemies. It sounds simple, but in practice - as the boards become more and more complex - finding the right way out can be a really big challenge. In addition to solving puzzles, we are forced to fight against enemies appearing on the boards. Both the fight and the usual movement work in turn-based systems, evoking associations with titles such as Lara Croft GO. The key is - again - clever manipulation of the boards, thanks to which we exclude some enemies from the fight and gain an advantage over others (e.g. by overtaking them from behind). From time to time, passing the level will require defeating an extremely dangerous opponent - the bosses, who, like our character, has the ability to manipulate the board. Euclidean Skies can only be played alone. The basis of the game is an extensive single player mode. Apart from dozens of handmade levels (including several boards known from Euclidean Lands, whose task is to gradually introduce the player to the rules governing the game), we can also find here the possibility to continue playing indefinitely - it is given to us by a special generator of random locations. Euclidean Skies has a very attractive three-dimensional graphic design, which is undoubtedly one of the greatest advantages of this production. The boards are characterized by a beautiful, fairy-tale style, and the architectural style of the buildings is sometimes twisted and can really impress. An additional attraction is the augmented reality mode (available on phones with iOS system), thanks to which we can see from each side strange, three-dimensional air locks.... suspended in the middle of our room.